Venison meat in the UK is more-often-than-not produced from freely roaming deer, rather than other meats that are intensively farmed. 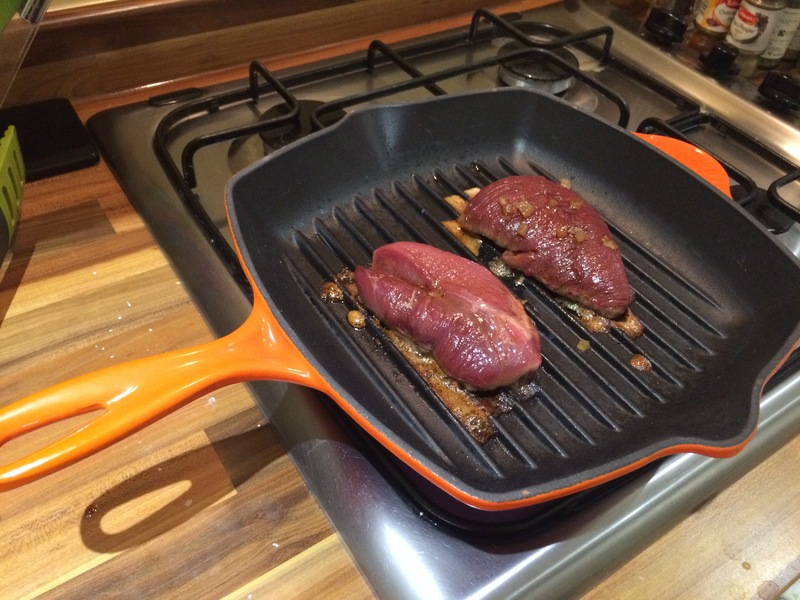 It is often found that venison is therefore very tender, and whilst this is not an everyday meat, when we do choose to indulge we also benefit from a higher iron content and more omega 3 than other red meats, meaning it’s very good for you too! The recipe we’ve created at Season’s Eatings uses a marinade with strong flavours (ginger, Chinese five spice and pomegranate) to match that of the meat. We serve this on a beetroot salad, which you can either make yourself or save time (i.e. cheat) like we did and buy a pre-bought one with designer leaves too – the end result is the same. We also served this venison dish with some sweet potato wedges. Simply cut up the sweet potato, no need to peel the skin. Place on a baking tray, drizzle over a good helping of olive oil (not extra virgin), sprinkle with a large pinch of salt, a bit of freshly ground pepper and a sprinkle of smoked paprika then bake for 40 minutes at 180ºC. Finely chop the piece of stem ginger then add to a shallow bowl with the ginger syrup, soy sauce, olive oil and Chinese five spice. Mix together, then lay the venison steaks in this marinade, turning until well coated. Cover and leave for 30 minutes. 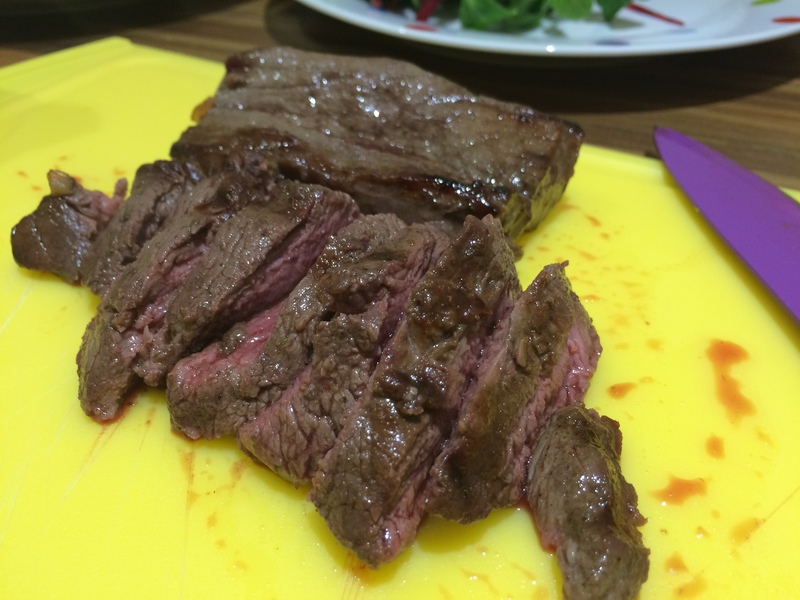 Warm up a griddle pan, then once hot, add the steaks – retaining their marinade in the shallow dish. Cook on a high heat for 2 – 3 minutes per side and if you like your meat well done, cook for a further 1 – 2 minutes per side. You shouldn’t need to add oil to the pan as the marinade contains oil already, and too much in the pan will just create smoke. Once cooked, wrap the meat in tin foil and leave to rest for 5 minutes, whilst you finish cooking the leftover marinade and begin to plate up. Turn the heat off under the griddle, add 4 – 5 tbsp of water, the leftover marinade and the pomegranate seeds. Stir around for 1 minute just so that everything is hot and well mixed, then pour out of the hot griddle pan into a small bowl so that it doesn’t all evaporate. To serve, place a couple of large spoonfuls of beetroot salad on each plate, then slice the steaks on the diagonal and lay on top of the salad. Drizzle over the marinade and enjoy with a glass of Rioja red.